SHED-IT is easy to use and has delivered outstanding, sustained weight-loss results in rigorous randomised controlled trial testing, with men who use the program as recommended losing almost 10kgs throughout the 12 week program (4-5kg on average). These results are comparable with intensive weight loss programs that require multiple face-to-face sessions. A recent study looked at the long term success of men who had lost weight using the SHED-IT Program. On average, the men lost 7.4 kg in the first 3 months. Three years later, the men had retained 60% of this weight loss, even though they received no additional support! To put this in perspective, these results are significantly better than most scientifically evaluated weight loss programs (Dombrowski,, 2014) and comparable to intensive programs including a recent U.S. study, where participants received 20 face-to-face sessions during weight loss and 12 follow-up consultations after the program had finished (Svetkey, 2008). What does the academic literature say about SHED-IT? Befort (2013). Bridging the gender gap in Behavioural Obesity Intervention: a Comment on Morgan et al. Annals of Behavioural Medicine, 45(2), 133-134. Phil is a Professor in Education at the University of Newcastle. He is regarded as an international expert in understanding and promoting healthy lifestyles in men. Phil has won numerous national and international awards for his research into weight loss programs specifically designed for men. Clare is a Professor in Nutrition and Dietetics at the University of Newcastle. She is a Fellow of the Dietitians Association of Australia, a well-known media commentator on nutrition and leader of the largest group of Accredited Practising Dietitian (APD) researchers in Australia. Robin is a Professor in Biomedical Sciences and Pharmacy at the University of Newcastle. She is an exercise physiologist with over 20 years of research experience and a pharmacist registered in NSW. 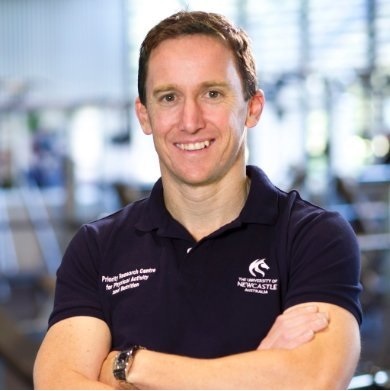 Ron is a Professor in Education at the University of Newcastle and Director of the Priority Research Centre in Physical Activity and Nutrition. Ron is an internationally regarded researcher in population health and physical activity research. Myles is a post-doctoral research fellow at the University of Newcastle. He was awarded his PhD in May 2015 and completed a Bachelor of Psychology (Hons 1A) in 2009. Myles’ research is focused on the development and testing of theory-based, gender-tailored weight loss and weight loss maintenance programs for men. Overweight men (BMI 25-42 kgm-2) aged >18 years, looking to shed a few kilo’s, with access to a mobile phone or computer with internet facilities. SHED-IT (Self-Help, Exercise, Diet & Information Technology) is an evidence based Men’s weight loss program developed by internationally regarded Men’s health researcher, Professor Philip Morgan, and a team of experts in weight loss, exercise physiology, physical activity, psychology and nutrition at the University of Newcastle’s Priority Research Centre in Physical Activity and Nutrition. SHED-IT has been specifically tailored for men and includes examples and scenarios that men can relate to and commonly experience. SHED-IT teaches men how to achieve realistic and sustainable weight loss by providing weight loss information (energy balance, calculating total energy expenditure and tracking energy intake) and outlining nine key weight loss messages. SHED-IT instructs men in how to track their weight and waist circumference; eating and exercise and to identify and record sources of social support and personal weight, physical activity and eating goals. Men are also instructed to track their steps using the provided pedometer and aim for a weekly average of at least 10,000 steps per day. Users are advised to consult their doctor or an appropriate allied health professional prior to participating in more vigorous physical activities. While SHED-IT is targeted specifically towards men, the information delivered in SHED-IT is also very relevant for women. In fact, many men participating in our previous SHED-IT men’s weight loss research have used the program with their wives/partners as a great way of motivating each other and losing weight together. Please note, women who are pregnant or breast feeding should seek professional medical advice prior to using SHED-IT.